There’s been a long debate within the revolutionary union movement about structure and specifically about the relationship between locality-based units and workplace/trade/industrial based units. Though not well known, the IWW also had battles with these concepts with different factions trying to abolish the General Recruiting Unions, the predecessor of the General Membership branch uniting all workers based on a local who lacked a Industrial Union Branch, and other trying to support it. The recruiting unions were banned at some periods of IWW history and had to be brought back though not without controversy. Other revolutionary unions such as the CNT of Spain and FORA of Argentina maintained both locality based grouping and workplace based ones. This piece explores the debate around these issues within the IWW and experiences both with locality-units and workplace-units from recent activities, and attempts to get at the issues of our tasks and objectives beyond only looking at structures. In the early 2000s a series of experiments were carried out in the IWW that led to the formation of Industrial Union Branches (IUBs). Alongside the handful of IUBs emerged ideas around why IUBs should be prioritized and their superiority to other structures. The IUBs primarily were initiated in the Portland IWW after a series of struggles that produced the largest and most dynamic area for IWW workplace organizing in the union for decades. The Portland IWW ballooned to its peak with membership in the hundreds in the early 2000s after a decade of organizing attempts in the 1990s, and some high profile contract campaigns, strikes, and actions at the turn of the century. As membership grew, Portland moved from a General Membership Branch (GMB) towards IUBs in areas where there were a concentration of members: social service, construction, education, restaurants, grocery/retail, and transportation. General Membership Branches were created late in the IWW’s life. At it’s peak, the IWW was built on active workplace branches centered in industries. The IWW arose in a time different from ours in which workers were actively seeking out alternatives such as the IWW. Before the IWW existed, groups like the German brewers, Western Federation of Miners, La Resistencia of the Tampa cigar workers, and others openly moved to revolutionary anti-capitalist ideas, and workers struggles moved towards insurrectionary militancy in conflicts with the police, militias, and military. Workers ended up far to the left of the unions through their aspirations for a better world, their actions, and the necessity of confronting a hostile system. The IWW often organized by going to these wildcat strikes, and attempting to organize the striking workers. In other cases radicalized workers would move to the IWW as part of their trajectory against the political and union establishments. In an environment where there was already active workers struggle that outpaced both the political parties and unions of their day, centering the structure of the IWW on workplace structures made sense. 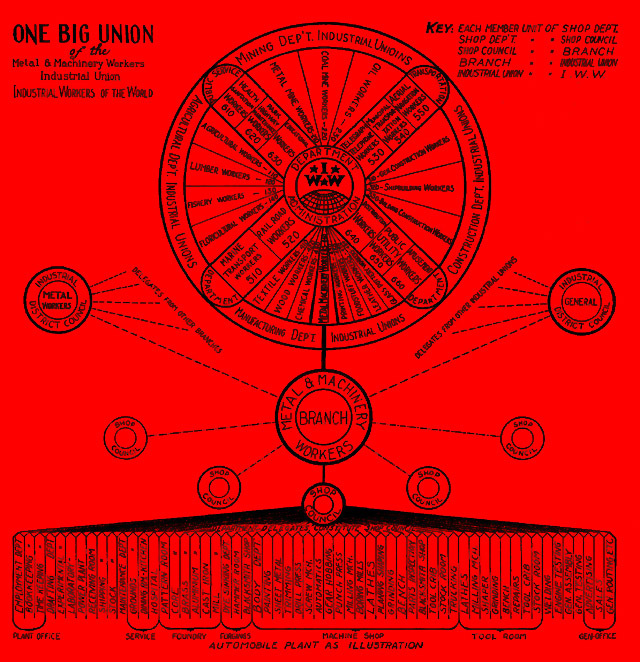 Though other formations existed such as Industrial District Councils (where multiple IUBs coordinated in a city, which the Portland IWW also had in existence) and General Recruiting Unions1 (similar to GMBs today, where workers without IUBs could begin to plan their IUBs), it wasn’t until after the total collapse of the IWW’s workplace presence and in a new regime of State-Labor-Capitalist collaboration that GMBs were proposed. GMBs are location-based structures, grouping workers of mixed trades and industries centered in some geographical area. They provide a common administration and space for the activity of all members of the union, typically in a metropolitan area today. The rise of the GMB as the basic unit of the IWW coincided to the rise of activism within. The post-war IWW was at its weakest point and attracted largely people interested in its historical legacy or activists seeking a union flag to fly over their activism. Today we continue to see this legacy with a steady stream of activists who come to the IWW and attempt to use the organization to advance the ideas, interests, and practices of the activist world. With the growth of organizing in the IWW also came a backlash against the problematic politics of activism. IWWs in the early 2000s involved in workplace organizing ran up against the culture of activism that was often insulated from the lives of the working class, and a subcultural hostility towards building a radical politics out of such work. In the two decades of active visible IWW work, the organization has continued to come up against the politics and culture of the activism in its various forms (support for leftist small business, hypocrisy on labor, relationships with the institutionalized left within NGOs, parties, and unions, and a toxic culture/subculture towards outsiders). The critique of activists within the IWW grew together with the critique of the GMB. I was one of the people who believed that the GMB bred unproductive activism and a return to workplace structures like IUBs would bring about needed change. Consequently I became a strong advocate of forming IUBs and dissolving GMBs. It was argued then that having a group meeting to work out concrete needs around specific workplaces would buffer against activist tendencies towards the various single issue campaigns that change with the seasons and distract from more sustained building of revolutionary currents in the working class. Activists would have a harder time in IUBs as they would have to come to the table with the intent of organizing their workplaces and connecting their proposals to the IWW. Best-case scenario it could lead them to break from activism and try to build more revolutionary alternatives through struggling around the daily lives of the class. The IUBs all failed, and outside of Portland all were extremely short lived. The reasons are pretty straightforward. Dividing the relatively small groups of IWWs multiplied the amount of people needing to do the tedious work of administration. Each IUB had delegates, secretaries, and treasurers. Generally a few dedicated militants carried a branch. Without capable dedicated militants to move projects forward, the best organizers often ended up becoming administrators; effectively decreasing their time to do the organizing work that sustains, inspires, and develops its members. More importantly worker participation in direct action is minimal, and generally lacks a sustained collective aspect today. The IWW was able in its best moments (and one of the few projects unfortunately to do so) to recruit and radicalize individuals through its organizing of workers outside of activist or left circles. Still, those militants were in single digits based on maximal effort. Typically our workplace committees and IWW unions have not outlasted the fights that they take up, something largely reflecting the will and perspective of workers who have rejected sustained conflict with the boss, despite our spirited endorsement of it. This makes workplace structures difficult to sustain. Recruits tend to be individual and shifting. Campaigns are short lived and traverse industrial lines. Shops go through quiet periods, and industries wax and wane. Similarly Industrial Organizing Committees (unchartered industrial bodies created to do the groundwork for a stable IUB to emerge) didn’t ever gain much traction. Committees organized for years without creating a stable workplace base large enough to justify IUBs. This is a situation we shouldn’t expect to change until the political landscape is altered radically (which may or may not be happening in this present cycle of crisis and class recomposition, and much of that will be determined by the actions of workers worldwide). Otherwise, we must learn to live and adapt to organizing in an environment where revolutionary ideas and action have extreme difficulty taking hold and staying, especially in organizing. While the spirit of IUBs is correct (focusing on concrete solutions to problems of the class that revolutionary politics can struggle around), the structural solution does not match our environment nor conquer the problem of activism. IUBs don’t exist because no one thought to try, but because there isn’t the self-activity of the class that makes them possible. In many ways the GMB mirrors the situation we find ourselves in which we organize to develop IWW militants who can carry their fights on once things cool down. Those individuals form a network of revolutionaries organizing in their cities and towns, and take it with them through their jobs. We should be experimenting and thinking around how to build workplace organization, and experiences that come out of that can help us get a sense of where we are at. It’s likely that organizing will not keep to neat and tidy models of made up by whatever classification schemes we think up. The IWW of old suffered from a fetish for technocracy in believing that adopting industrial structures would give us some automatic powers to defeat capitalism. However we carve up workplaces, the real issue is about how we can contribute to people dedicating themselves to constructing a new society. However they get there (whether by fights around their craft, industry, area, etc) is somewhat secondary. There should be a recognition that sustained revolutionary workplace organization needs a specific environment to exist. People have to be willing to wage a battle with significant risk and little likelihood of success against a formidable enemy. To engage in those kinds of struggles people need experiences that lead them to it, and the revolutionary convictions that will keep them around throughout the failures that come. That is our basic task today, and should lead us to rethink our GMBs and our work. Maybe we can make better use of what we have by recognizing the function of a locality based organization to address the totality of life under capitalism alongside committees and structures of workplace networks of militants like shop committees, industrial organizing committees, and eventually workplace branches. The GRU wasn’t the same as a GMB, there were several important differences. GMBs have no organizational relationship to each other. Yes, they are local organizations, but strictly that. The GRU was the union for all the potential IUs. Branches of the GRU reported to the GRU Hq not GHq. When there were enough members/need for a new IU it “came out of the box” (the term), was separated from the GRU. When the last of the IUs collapsed, so too did the GRU. I think 510 and GRU lasted until the mid-1950s. There were a couple of 510 branches still when I was a baby wobbly. The important thing about the GRU was it gave training in running a union. It gave a framework for building IUs in multiple locations, something the GMB set up doesn’t. The major problem with the multi-branch IWW in Portland in the early 2000s was the bureaucracy. Each branch had to replicate the same officers, sit in too formal meetings, pass along formal reports to another functionary body – the Industrial District Council, then wait for a half-yearly meeting to rubber stamp. We could have as easily set up a administrative committee to do the books for the branches, etc. Which gets to my next point. At the present time, I see the biggest issue with the IWW growing being the GMB system and the isolation/local patriotism it brings. We needed the GMB system in 1955 to stay alive. It’s a fetter for us now. In any locality what the IWW encourages is formation of a GMB. Beyond that is kind of unknown territory. The IWW is doesn’t encourage seeing itself as a unitary organization, we’re the [city name] IWW not the IWW in [City]. Every city now has it’s own logo. Organizing drives no longer identify with an IU, become their own named unions, etc. There was concern when SWU started what happens when the indy show next to the Starbucks wants to join too. Does SWU take them in? etc. I’m sure we all know the question, but we need to discuss again. I’m being a bit wide here, trying to be brief, but I acknowledge there is a lot of gray area in this discussion. However, I do think we’re undermining the organization with localism. FNB your comments really speak to my experience, both in terms of branch isolationism and the bureaucracy we experienced in Portland during those years. I also didn’t know that about GRUs, that’s interesting and I’d have to wrap my head around that. Figuring out how to get branches to work together is something I’ve struggled with for a bit without clear solutions beyond increasing communication and collaboration. I would add to those issues that branches even when into their own isolation don’t act as decision making bodies or engage in the politics for lack of a better word of the union. We often have less of a base democracy of branches than we do a democracy by email and letters, something that needs to get fixed through creating cultures of active engaged localities that coordinate and discuss. The how is the million dollar question. I think it boils down to Organizational psychology. When you’re a new to the IWW, the GMB system re-enforces a view that a local group – the GMB – is the penultimate IWW structure in an locality. What does a GMB do next? What does it grow into? How do GMBs relate to the rest of the union? None of this is anticipated structurally. Is it any wonder GMBs fall into a local vortex? I would argue for a two tier chartering of IWWs in localities. First level would be virtually the same as GMB (General or Local Organizing Committee?) same rights and priviledges, The GOCs would be tasked The second level would be for GOCs who have buiilt functioning IOCs.IUBs wouldn’t exist but operate internal to larger organization. A measure of IOC functioning would be it’s operation/integration within their Industrial Network or union. The above is closer to the AWO model, IUAW, WIIU or Canadian based OBU. The other idea, just throwing out, is adapting another aspect of the organizing models of the above. They all allow the local organization to choose best local organizing divisions. So corporate campaigns (eg JJWU or SWU) could meet seperate from other 640s if it made sense, or specific campaigns (like Mobile Rail) wouldn’t need to charter seperate IUB just for itself. There’s arguements for this model, it worked well in places (mainly smaller towns). Just thinking outloud so we can have the options Scott advocates above. I had experience working on a city-wide campaign against plant closings back in the 1980's and found that plant level organization can feed into a city wide campaign. AFL-CIO union leadership is very provocative in shop-level organization and maintained a hostile attitude when confronting engagement of "its" workers outside of their dead-end projects. There is a consolidated and significant factor to address in regards to the AFL-CIO collaborationists. Success depended on efforts at numerous plants throughout the city that could be evaluated and adjusted based on circumstances to increase the focus and strengthen the engagement of the rank-and-file. Shop newsletters addressing plant closings helped to develop a city wide general meeting where over 10 different unions had representation. Developing the concept of dual power and councils is something we failed to concretize as an objective from the beginning of the campaign. This resulted in a militant reformism and after plants closed down and workers were unemployed, the campaign collapsed. There is a definite learning curve as to how one union, the IWW, can develop organizationally in an area and expand its reach beyond one given shop. . It is good to see that people are confronting these issues head-on without polemics or trashing others.